There are the remains of some 500 brochs scattered across Scotland. The distribution of these round stone towers tended to be densest in Shetland, Orkney, Caithness, and on some of the western isles. But in very few places were they as densely grouped as along the shores of Eynhallow Sound, on the north east coast of Orkney's West Mainland and the south west coast of Rousay. Two brochs almost opposite one another across Eynhallow Sound give an excellent impression of what these structures were like: the Broch of Gurness on Mainland and Midhowe Broch on Rousay. 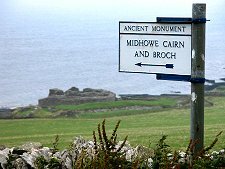 You reach Midhowe Broch via the track through and between fields that descend the 100m from the parking area on the road that encircles Rousay. 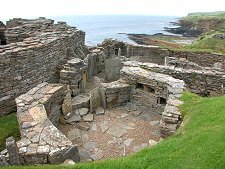 Having reached the coast you first pass the stone hangar-like building that houses the magnificent Midhowe Cairn before approaching Midhowe Broch along the shore from the south east. 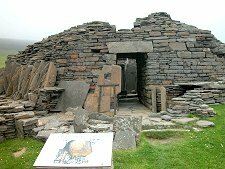 Midhowe Broch was built some time in the last centuries BC. It occupies a naturally defensive site on a promontory. The name "Midhowe" means middle mound and this is just one of three brochs closely grouped together. North Howe Broch still lies under a mound in the next field to the north west, while South Howe Broch lies a few hundred yards to the south east: close to the ruined farmstead of Brough, and steadily being cut away by the sea. There are the remains of another four brochs along the five miles of shoreline between South Howe Broch and Trumland Pier. 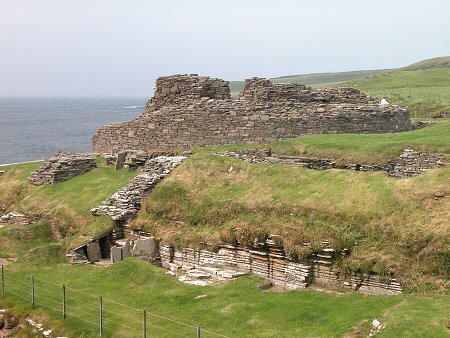 There is sometimes debate about whether brochs were primarily for defence or for show, and whether their role changed over the centuries during which they were in use. As you approach Midhowe Broch you are left in no doubt at all that someone very definitely intended this broch to withstand serious attack. The promontory on which the broch stands has been emphasised by channels cut into the rock making access along the shore much more difficult. Access from the landward side was deterred by a massive defensive forework involving two ditches and a rampart. The wall that today encloses the seaward side of the broch was built to defend it from the sea in the 1930s. 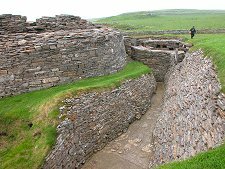 At Midhowe the broch walls rise to a maximum height of 4.3m. This allows a clear idea of the extent of the structure: though originally it would have risen to two or three times this height. 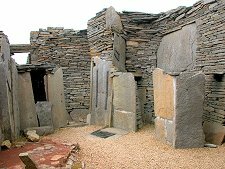 Perhaps the most impressive feature at Midhowe is the way an attempt has been made to use the large flagstones found when the broch was excavated in the 1930s to recreate the internal layout. 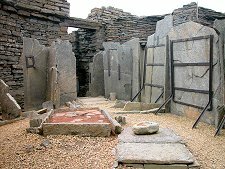 Large flags divide the interior space into two smaller areas used for working and storage, while around the sides of the broch they have been used to reconstruct various items of "furniture". 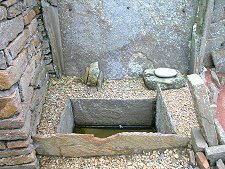 An especially nice touch is the spring-fed water cistern which, after more than 2,000 years, still seems to work as the original builders intended. Within the thickness of the walls, stairs give access to the level of the top of the wall. 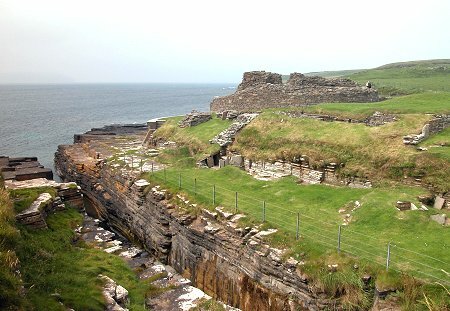 Originally they would have allowed access to upper floors of the broch. 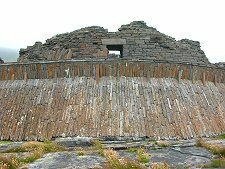 Outside the main broch are a number of additional structures used for accommodation or storage or, in once case at least, iron working. These were added at a later date, as some were built over the original inner ditch of the landward defences. Pottery and other artefacts found during excavation give evidence that these were still in use at a time when the area had trading links with the Roman Empire. STB 5 Star Historic Attraction. Grid Ref: HY 371 308.